BOWLAND BADASS 2012 | Riders Cycle Centre. Cycle repair and service workshop. 50+ 5Star Google reviews. Bicycle consultancy. Custom wheel & bike builder. Maintenance courses. I knew he had something planned. He has been cleaning and pampering me all week. New 700c Continental slick tires replaced the MTB tires and he even fitted me with a new chain, cassette and chain ring and the icing on my suspicious cake was the fitting of a second water bottle cage. I spent Friday night in the back of the car along with his camelbak bulging with energy gels and bars. His GPS, which he fitted the night before remained silent so i was left to ponder and see what was to come. 5am and he’s awake. Blimey, he’s keen. Even Jade is up. She must be giving him a lift. We spend an hour on the road and arrive at our destination. I’m unloaded, wheels put on and he gives my chain a final oil. HHmm nice. “Take care babe and Ill see you tonight”. TONIGHT. Its 6am. What have you got planned for me. He wheels me over to a crowd of fellow bikes. Hold on a minute. Road bikes, loads of them. I’m a 29er with slicks on, your not mixing me with the fast boys again are you. He wonders off to grab a tea whilst I have a quick chat with a Ribble. A rather posh Specialized Tarmac glides past but stops to ask if I’m ready for the BOWLAND BADASS. It all come’s together now. 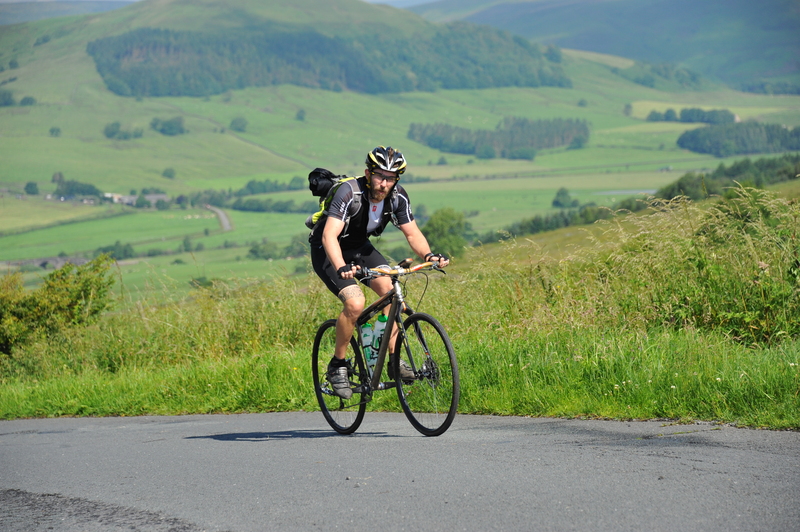 A 166 mile road ride through the Lancashire lanes which includes a mammoth 18.000ft of climbing. This explains the chamoix cream and gigabytes of trance on his Ipod. I join the other bikes and their riders for a quick briefing and very soon we are off. I’m hoping Stuart doesn’t do his Jack Russel impression and start nibbling at the road bikers wheels, this is virgin territory for us both. Unseen Lancashire roads await us and the recent bad weather has lead to reports of gravel and damaged lanes on Pave proportions. I’m pleased to say he set off at a controlled pace and with the sun shinning we began to eat into the milage. My new tyres where a vast improvement on the CX tyres he used on the Etape and the WRC but the back country lanes required some tentative cornering and gravel and rocks strewn across the roads illustrated the damage the excessive rain had caused. In the back of my Titanium mind I had to remind myself why the ride had the word BADASS in it’s name. 166miles was a distance that I knew Stu could accomplish but the climbing was to test both our resolve and resilience. This link will show you the route. After 50 miles we had our first food station stop. I was left up against a lamp post as he tucked into a rather impressive array of sandwiches, samosas and sweets. Other BB’s joined us and I had a chance to mingle with some carbon gorgeousness and lightweight bling. After some quad and calf stretching and a fresh dollop of chamois cream we set off. Mile after mile. Climb after climb. Photo courtesy of www.sportsunday.co.uk Event Photography. We soon met a fellow cyclist heading towards Tosside which was a welcome change to the solitude. As our riders chatted we concentrated on the road and exchanged tails of woe and of pot holes, fast descents and beautiful sunny views. We parted at the Dog & Gun pub and continued to tame the Badass. The Dales have been my home, either on road or off. The fresh lanes and views kept our minds fresh and fulfilled. Stuart loves views. I can sense his enjoyment as he clicks down a gear and strides up and over undulating terrain. The Trough of Bowland was on full show and the sunshine was making the Badass a little less intimidating. Our next food stop was for Stu, in the wrong location. A prolonged pause to stock up on supplies would result in the climb up and over Pendal Hill a daunting prospect. With my tyres still hot he called out his number and peddled me up towards another tick-off-the-list-climb. What a day. I’m loving this. Dry roads and wonderful views. Rewarding climbs and fast descents. But remember, there is a saying in this part of the UK “If it’s not raining now, it soon will be”. Well this was to come to fruition as in the distance I noticed dark dark clouds and the rumble of thunder made Stuart lurch me into life. I think he thought he could out run the rain. Silly man. He should know better. There is almost 120 miles in his legs. As I was steered around another sharp bend and towards another out-of-the-saddle climb, rain began to splatter my bar’s and a clap of thunder preluded a downpour that was to last for the remaining 4 hrs. The third food stop was another quick one. I had the feeling Stu wanted to rock on and return to Garstang. The deteriorating weather brought apon a sense of urgency in his pedal stokes and as he tucked into his gel’s and High 5 bars and with flumes of water flying off my tyres we began to tick off the last 30miles. I don’t know if the organisers intentionally meant to tease us but to see two signs to Garstang being only 4 or 6 miles away and for the BB black arrow sending us in the opposite direction lead to a quiet giggle and to a “It is what it is” moment. The GPS was clicking off the miles and the blue digital arrow was being lead on a merry circle as we concluded our BB epic. Garstang and the finish line soon filled the screen and as we approached the finish line I noticed Jade parked up, leaning out the window and with a rye smile shouted “At last, what time do you call this”. We free wheeled towards BB HQ and was greeted by smiles and congratulations. No crowds, no noise, no fuss. A reflective moment to look back at a ride that would speak for itself. Big thanks to www.SportSunday.co.uk for the photos and a big BIG thanks to all who help organise a great event. Big pat on the back. Great write up. Fave line: “This explains the chamoix cream and gigabytes of trance on his Ipod” LOL! well done mate. that was an epic day out and no mistake.